She won’t be racing at the Boston Marathon this year, but the 2017 New York City champion still has pre-race nerves. On Monday, Shalane Flanagan was passing time in the Portland Airport on her way to the World Cross Country Championships in Denmark, where three of her Bowerman Track Club teammates will compete on Saturday for Team USA. Flanagan hasn’t been to the championships since 2011, when she brought home two bronze medals for her individual and team performances—which is also the last time an American woman and team were on the podium at the notoriously fierce international competition. This time, however, Flanagan is on board in a different role: as a coach, supporting the U.S. women in general, but Bowerman athletes in particular, including Courtney Frerichs, Marielle Hall, and Karissa Schweizer, who join Anne Marie Blaney, Stephanie Bruce, Sarah Pagano, and Elaina Tabb to complete the squad. At a time when Flanagan is usually in the throes of marathon training, she instead has enjoyed a vacation with her parents and husband, Steven Edwards, in New Zealand, preparing to join the Boston Marathon broadcast team at WBZ-TV, and helping members of her training group get ready for their spring races. During a phone interview with Women’s Running, the four-time Olympian shared her thoughts on what she wants to bring to the sport’s television coverage, why she’s not currently training, and her hopes for an expanding family. Women’s Running: You’ve done a little television commentating before—what have your previous experiences been like? I loved my experience. It’s definitely a reflection of who you work with. [On-air personality] Toni Reavis is like an encyclopedia and tees me up well with good questions that he knows I’m going to be capable of answering and highlighting my knowledge. And then [anchor] Lisa Hughes’s knowledge is extremely valuable as well. She’s interviewed me the many years I’ve run the Boston Marathon, so I’m very comfortable with her. Boston loves their sports and they put on a great production. It’s an all-day affair. I loved it. I got the same types of nerves and excitement that I would to race. I loved the pressure, too—how I go out and perform is a similar feeling to competing. Then Nike asked me to come to Italy for the Breaking2 broadcast as a backup commentator to Paula Radcliffe. I learned a lot and at the very end I did hop on air and concluded the last 20 minutes of the race. It was an honor to be part of that. It was pretty epic. Has anybody given you any tips? Who have you watched? I’ve wanted to learn more about commentating. Craig Masback at Nike, who also does NBC productions of track and field has been a great mentor to me if I have questions. I feel like there’s so much to learn and I’m trying to learn as quick as I can. The best way is through experience. I’m hoping to get better and work at it. I think I have a passion for it, but I don’t know. I’m exploring it. Carrie Tollefson does a great job; Juli Benson has been great. There needs to be more female voices out there. I’m excited about the potential and hopefully I have as much excitement for it that it requires. How do you prepare for the broadcast? You have to do a lot of homework. You’ve got to look up stats and be prepared to have tons of notes. Marathons can be very unpredictable, so the last person you thought was going to win the race could be winning. You can’t overlook anyone—you have to look up what their current form is and get tidbits about them beyond the athlete. Like, what’s their favorite food? Craig calls them “water cooler moments.” The next day, is there something people are talking about beyond the athletic performance, like some tidbit of insider info about an athlete that made people smile, laugh, and humanized them? I want to show that they’re more than just runners and show they can relate to the back-of-the-pack or mid-pack runners. What else has Craig taught you? Craig prepared me for little nuances and logistical things. He said sometimes you’re just looking at a tiny TV screen and it’s hard to see. Or you could be freezing for hours because the broadcast is on a scaffolding and you’ve got wind and elements to deal with, so you’re trying to pretend you’re not cold. Sometimes you don’t realize how close you are to the other commentators—you’re on top of each other. You feel like your personal space is being violated, but it’s good for TV. At this point for me, it’s building the confidence that I’m capable. The nerves are high for me because I want to good job. I want to come off as more confident and at some point carry more of the broadcast. When you do your research do you talk to athletes beforehand? I’ve reached out to agents because I understand what it’s like to be an athlete and have people ask a lot of questions at the last minute. Sometimes it depends on your mindset—sometimes it hasn’t bothered me at all and I love to chat. Sometimes I feel just edgy enough that I don’t feel like talking. I try to be respectful of individual athletes and what they need to perform well. I’d never want to take away from that. I value my relationships with agents and coaches—I try to talk to them more so. I’m going to be in Boston for the press conference this year, so hopefully I can pick up some tidbits to add to the broadcast. Mostly it’s just being a fan and student of the sport. Naturally I keep track of how athletes are doing and what races they’re running. I definitely have a bias toward the women’s racing, though, so most of my homework is studying the men’s race, making sure I can pronounce names correctly, and knowing about athletes from different countries. 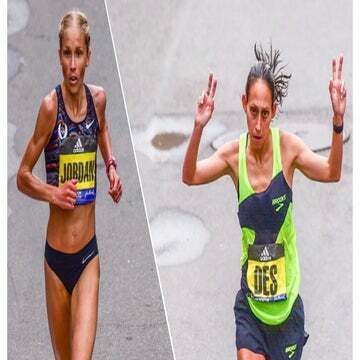 After nearly every broadcast of track and field and road racing, we can always point toward moments when the predominantly male commentators have remarked on female athletes’ bodies and appearances. Is that something that will only change when more women are invited to the mics? What’s the answer? Every now and then I go back and watch broadcasts—I should probably do more homework and hear what’s being said. I’ve actually been kind of unaware of the fact that there are comments made like that. To me, it’s not relevant. It wouldn’t even come to mind—I’m thinking about their character and ability to compete more than anything. Our bodies are our vehicles for performance, so I guess in some instances it could come into play. But I’ve never really considered talking about the physique of athletes too much. I understand to a degree why it would come up, but in my headspace it’s not something to focus on. Do you get more nervous to race a marathon or be on the broadcast? It’s very similar, actually. You know when you’re really fit and a prepared—the nerves are just a different level. Because I’m so new to broadcasting, the nerves are extreme. When I first got started in running, I was terrified for half of my races and paralyzed at times. Thankfully I haven’t been paralyzed on a broadcast, but I’ve had limited chances to practice, which intensifies the butterflies for me. It’s a good nervousness, though—I have a team around me who wants to make me look good, so I feel confident in them, which helps me relax. The fact that they think I’m capable and believe in me gives me a little boost. I want to give insight and show my sport in a great light, so I take it seriously. Every time I commit to a broadcast, I end up saying, “Oh god, why’d I do this?” It’s good to be challenged in a new way. Drawing a blank, like forgetting an athlete’s name or not knowing how to pronounce a name. I just want to be respectful. But that’s the great thing about a marathon—it’s a long broadcast, there is time to retell a story and make fun of yourself if you mess up. I’m more inclined to doing marathon broadcasts than track and field because the intensity of events. Track races are so quick—you have to be so sharp and so on, I don’t think I’m at that level yet. Plus my interest lies in telling stories about athletes, so to have three hours to do that seems more fun to me. What have you enjoyed most about it so far? When you say something that’s remembered, it makes you feel good. People after Breaking2 told me that what I said made them get chills or get choked up, so to make a connection with people was really nice. 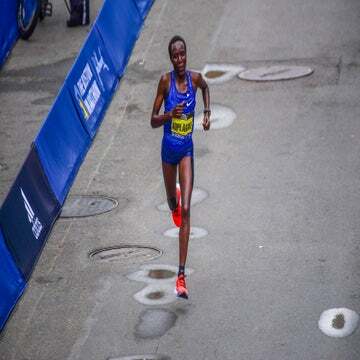 I didn’t say anything profound and it was quite obvious—sometimes just stating the obvious is all you need to do—I said, “With each step Eliud Kipchoge is taking, he’s making history.” No one had ever run that fast [in a Nike experiment to break two hours in the marathon, Kipchoge finished 2:00:25]. That’s not profound, but it needed to be said in that moment, that even though he wasn’t going to break two hours in a marathon, it was still something that nobody had ever done before. You hope you have one of those moments, because that feels good. You’ve been in similar circumstances as all the athletes you’re watching will be in. You bring the context to it that others on the broadcast don’t have. That’s my greatest asset. I’m never going to be Toni Reavis, a human encyclopedia, but I have a completely different skill set and perspective. What do your quads feel like at mile 20? They feel shredded, like somebody’s taken a stapler to them. I can offer insight and description that they haven’t experienced. I hope that people can somehow find that relatable. Any thoughts on the women’s field yet? Edna Kiplagat [of Kenya], you can never count her out. She’s competed in every major marathon and has won most of them. Despite her age, she doesn’t seem to be slowing. You have some athletes who are lesser known, like my former teammate Betsy Saina. She won the Paris Marathon two years ago and she’s in Kenya training really hard. You never know when athletes are going to have a breakthrough moment. And then of course the U.S. women are always in contention now. I believe our confidence is a lot higher. We believe in ourselves more than ever now. Des is really good at Boston—she’s the total package mentally, physically, the whole thing. You can’t count her out and having the swagger of defending champion doesn’t hurt either. There’s a lot fresh, new faces we’ll see in terms of East Africans. Getting to know them and do some homework will be good for me because some of them are a lot younger. Let’s turn to you and what you’re up to now outside of preparing for television. It seems like you’ve been taking on a lot more coaching-like duties with the Bowerman Track Club over the winter? Yes, I would classify what I’m going through as kind of like an internship. I’m not a completely retired athlete yet. My knees have been bothering me quite a bit. I’m getting them closer to being completely healthy, but they’re still fickle. I have good days and bad days. I promised myself I wouldn’t make a decision [about retiring from competition] until I am completely healthy. Of course I wouldn’t want to run while my knees hurt, so if I’m not healthy and feeling good while I’m running, it’s not a good time to figure out what’s next. I’m very much dedicated to and excited about coaching. [Bowerman coach] Jerry [Schumacher] has given me a few responsibilities with the team this winter and I’ve loved every second of it. I get to go right now to the World Cross Country Championships, which is one of my favorite races that I’ve ever run. It’ll be a great experience. I told the women that it’s the hardest race they’re going to run all year. From here on out it’ll just get easier—we’re going to tackle this and hopefully have fun and have some good results. I’m getting more responsibility and I’m loving it. It’s really rewarding and really fun. I feel just as passionate about their running as I do my own. I’m not writing the Xs and Os of training, but being there for the women in other ways like emotional support, advice, and a lot of ways I’ve always been there for them, but during this time I haven’t had one concern about myself as an athlete to have to also think about. The focus has been solely on them. I joke that I’m the bag lady and Sherpa—I’m carrying their stuff at races. But I love being in a supportive role. I see their great results and helping them is extremely rewarding. Seeing their progress—their confidence build, their fitness build, and their small transitions on a daily basis—I really enjoy watching them train and evolve as athletes. So, what’s going on with your knees anyway? I thought I’d just take some time off like a normal injury, but I’ve had really bad tendinopathy and some tears in my patella tendons. From what I’m understanding from all the experts, they take a really long time to heal. I’ve done everything under the sun to try to get them to be happy, but I’m realizing it’s a long road toward getting them healthy. It’s quite frustrating because I’ve never really had tendon injuries; I’ve always had bone injuries, when you’re like, “okay, in 10 weeks it’ll be healed.” But tendon problems are a rollercoaster—one day you’re good, the next day you’re in pain. I have a lot more compassion for this kind of injury now. I’m at the point where I’m grateful if I can run one day and then sometimes I have to take the next day off. It makes me appreciate my running and that even if I don’t run at a high level anymore—who knows if I will?—I just want to get to a point where I can run an hour a day or warm up and cool down with my team and help them. I’m a little scared because I just want to get back to running for my life and health, so I’m trying to be cautious. I don’t want to ruin my chances of long-term running. I’ve been busy enough that I haven’t had time to feel too sorry for myself. You and Steve have said you’re in the process of potentially adopting a child, too? Any updates on that part of your busy life? Yes, we actually just concluded an Oregon Department of Human Services training for fostering and foster-to-adoption, just to open up all possibilities. We’ve applied for an infant adoption, but we’re on a wait-list for that, so in the meantime we are looking into foster adoption. That’s a different style of adoption, but it’s a way to adopt kids who are in the foster system. There are so many kids in the state of Oregon and across the country who need homes. [Bowerman teammate] Andrew Bumbalough and his wife are the ones who gave us the knowledge about this, because they adopted a little boy through the foster system and they continuously work with children. There’s such a need and my heart goes out to these kids. I feel like Steve and I are in such a fortunate position to be able to give kids care and a home. It’s definitely something we’ve become passionate about—I never in a million years thought we would be doing this, but because of our experience [in 2016] having [foster daughters] Breauna and Keauna, it spurred us on to take the next step and adopt through the foster system. We may adopt an infant. We may adopt toddlers. We don’t know, but we’re putting ourselves in a position for whatever kids are in need. It’s scary but exciting. It’s a totally different life, but it’ll be fun.